Once upon a time, the crew of Voyager decided to test the limits of warp drive and exceed warp 10, which everyone thought was impossible. They selected Tom Paris for the job and he got in the shuttle, drove away, crossed the warp threshold, and returned as a hero. Then, he started getting really sick. For a while, everyone thought Tom Paris would die. He got all gross and mutated and freaked out. 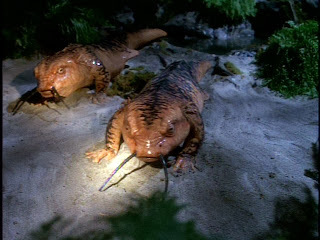 Then, all of the sudden he DID di.. Then he woke up, kidnapped Janeway, drover her her across the threshold and landed on a planet where they turned into catfish amphibians, had babies, and were found several days later only to be returned to their human form after a couple hours with the doctor. Wait. What? The first time I saw Threshold (often regarded as the worst episode of Star Trek ever, challenging even Spock's Brain) I thought I'd fallen asleep in the last ten minutes and had some kind of seriously jacked up dream. I couldn't even imagine that this weirdo, catfish/newt baby-making finish could possibly be real. Chakotay and Tuvok speculate about which salamander thing is Janeway and which is Paris. But by this point in the episode it just doesn't even matter since apparently going in a straight line at Warp 10 sends you right to the middle of Crazy Town, Nutsylvania on the planet, Absurdia somewhere in the middle of the WTF Quadrant. It's funny because I've probably seen this episode four or five times but it gets me EVERY SINGLE TIME. I always think, "Oh wow, I don't really remember what happens here. They're trying to break the warp barrier? That's cool. Why don't I remember this? What's going on with Paris? Holy crap it's this one! Got me again!" This happened yesterday. Scott was watching it with me and said, "Is this the one where they turn into salamanders?" I said, "No, I don't think so. I feel like that one comes later. But I can't remember what happens here..."
I'm actually glad I watched Threshold yesterday. Now I can just watch the rest of Voyager, relax and say with confidence that, "No. This is definitely not the episode where they turn into space amphibians." I always wondered why they didn't bring the babies back and turn them into humans, if they could turn Tom and the Captain back. Now that would have been an interesting plot twist! Kellie, I KNOW! It seems ridiculous that they literally just desert Tom/Janeway's infant offspring to fend for themselves on an unknown planet in the Delpha Quadrant. But really, I think at that point everyone was just kind of washing their hands of the situation. Whenever I see this episode I wonder if the writer accidentally ingested some hallucinogenic mushrooms or something 3/4 of the way through writing the script--and thus, the salamanders. Alternatively, the writer could have left the script laying around and his kid sat down and wrote the rest of it. I think they left the salamander kids behind because no one wanted to be reminded of what transpired on that island. What happens on random planets in the Delta Quadrant, stays on random plants in the Delta Quadrant. This one is just weird. 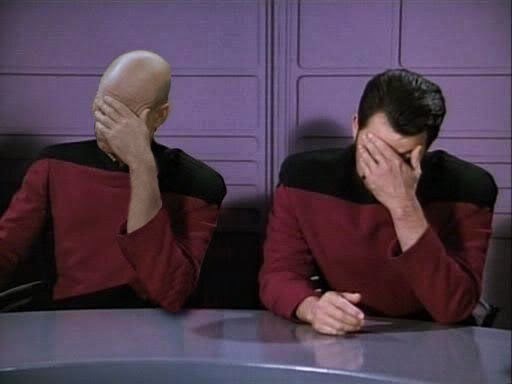 Not to mention Kirk's Enterprise exceeded warp 10 several times, going up to 13 once. They never turned into salamanders. Maybe it has something to do with Delta Quadrant mojo. If you don't remember this episode... chances are you've blocked it to spare yourself trauma. That last quarter of the episode quite efficiently renders the entire episode "terrible". And not even in a "so-bad-it's-good" kinda way. Sadly every time I see this one, I think of the premise being really neat until Tom goes all "cranky salamander". Even Brannon Braga (writer of "Threshold") admits it was terrible, which takes a lot of humility in my opinion. I rank this one up there with DS9's "If Wishes Were Horses", and that episode of TNG where Troi is a cake. Sometimes there's a stinker (of the "500-cow-dairy-farm" variety) in the bunch.